SpongeBob HeroPants is an action game with a focus on platforming, exploration and light puzzles and combat. 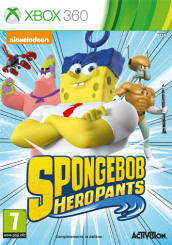 Each of its six playable characters – SpongeBob, Patrick, Squidward, Sandy, Mr. Krabs and Plankton – can morph into a unique super-powered champion to solve challenges, unlock new areas and defeat SpongeBob's crazy imagination. The full adventure features boss battles, upgradeable skills and a treasure trove of hidden items to unearth. It also includes four-person local drop-in/drop-out cooperative multiplayer on Xbox 360. Providing exciting rock venues, characters, guitars, and play modes, Guitar Hero II on the Xbox 360 allows players the opportunity to unlock achievement points, download themes, picture packs, and most importantly, new songs through Xbox Live Marketplace. An intuitive online leaderboard feature will also be utilized through Xbox Live, allowing comp..
Rapala Trophies brings you authentic fishing action. Grab your tackle box, launch the bass boat and let's go! Time to set the hook and land the trophy of a lifetime.. Soldier of Fortune Payback evolves the signature gameplay of its predecessors with refined controls, tension-packed warzones, and an enemy damage system that may be shocking to even experienced FPS players. Boasting more weapons options than any previous Soldier of Fortune installment, Soldier of Fortune Payback’s impressive arsenal includes an arr..
Cabela's Alaskan Adventures is the ultimate hunting and fishing adventure to North America's last frontier. Experience all that Alaska has to offer, as you go on 38 hunting and fishing adventures across vast tundra. For the first time in one game, you will be able to hunt trophy animals, fish, bird hunt, dog sled through the Alaskan Artic, and comp..
What feature would you like the most in the next Xbox 360 update?